Bumper to bumper traffic is an inescapable, depressing part of daily life for many Americans, and no matter how many amazing podcasts you may have queued up, inching your way to and from work every day eats up loads of time you could be spending doing something a lot more fun. But have you ever wondered just how much of your life you're wasting away in the driver's seat during your commute? Well, if you're in the mood for a little masochism, the folks at Educated Driver just put together a revealing map that shows just how many days you'll spend commuting by car during your lifetime. The map, which plots lifetime commute times for 1,000 towns and cities around the country, was created using data collected by the U.S. Census Bureau. Specifically, the Educated Driver team considered the average daily commute time in a given area, then multiplied it by the number of days people work per year on average (250), and the number of years the average full-time worker works during their career (45). It's also worth noting that the stats don't take into account how long people who use mass transit spend getting to the office. The map is interactive, and you can either zoom in on or manually search for the findings in a specific area. 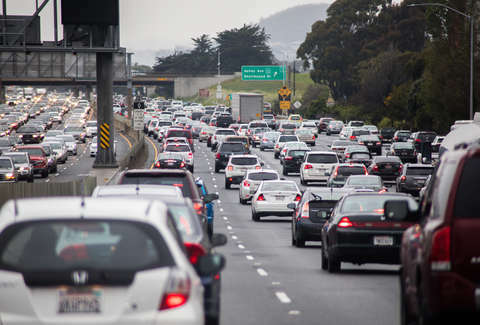 Unsurprisingly, people waste the most time commuting in densely populated and car-heavy cities like San Francisco, where an average person spends 502 days of their lives in the car going or coming from work, making it one the worst of the bunch. However, Chicago drivers have it even worse, wasting a whopping 506 days of their lives. Conversely, folks in Dodge City, Kansas are losing a relatively modest 220 days of their lives doing the same thing. Still, Americans are wasting a hell of a lot of time at large, considering the average person loses 408 days of their life commuting. Then again, when you figure that the most people sleep for one third of their entire life, 408 days listening to podcasts and singing to yourself in the car isn't so bad!